Republican U.S. Senate Minority Leader Mitch McConnell and Democratic U.S. Senate candidate Alison Lundergan Grimes prepare for their debate at the Kentucky Education Television network headquarters in Lexington, Kentucky, October 13, 2014. Senate Minority Leader Mitch McConnell is an unlikely candidate to be in a competitive race. He is an incumbent U.S. Senator and a Republican running for re-election when a Democrat sits in the White House. Not only that, his state backed Mitt Romney by more than 22 percentage points just two years ago. Yet as of this writing, the FiveThirtyEight Senate forecast pegs his chances of re-election at 79 percent. He’s a favorite, but by no means a sure thing. And if he thought otherwise, he probably wouldn’t be loaning his own campaign nearly $2 million for the campaign’s final week. Among incumbents, McConnell is not alone in finding himself in a tight race. Kansas’s Pat Roberts has some of the same basic attributes: He’s a Republican incumbent in a solidly Republican state. But Roberts’s race is as close to a true toss-up as any in the country. Incumbent Democrats, too, are in trouble. Sen. Mark Udall in Colorado is polling slightly worse than his Democratic counterpart in Iowa, Bruce Braley, even though Udall is an incumbent and Braley is not. It used to be that sitting politicians were loved by their home districts. But things aren’t what they used to be. Beginning in the early 1970s, political scientists noticed that congressional elections were changing, and that incumbents were enjoying an increased electoral advantage over challengers. Over the decades that followed, scholars’ interest in what they had dubbed the “incumbency advantage” grew — and so did the incumbency advantage itself. In a 2002 article, Harvard political scientists Stephen Ansolabehere and James Snyder showed that in the 1940s, the incumbency advantage was lower than 2 percentage points across the various state and federal offices they considered. In other words, incumbents were doing better than same-party, non-incumbent candidates in comparable districts by less than 2 percentage points. But the incumbency advantage then rose steadily for most offices, and by the 1990s it was above 8 percentage points for U.S. Senate candidates, gubernatorial candidates and candidates for more visible statewide posts such as attorney general and lieutenant governor. Because many voters will reliably vote the party line, the incumbency advantage is likely to come at least somewhat from winning the support of voters from the opposing party. It’s tempting to connect the rising incumbency advantage with the expansion of television. Maybe incumbents in the TV age were more visible, which helped them get re-elected. But as Ansolabehere and Snyder showed in their 2002 article, the incumbency advantage rose even for low-level state offices like auditors, despite state auditors not exactly being staples on television. More to the point, there’s mixed evidence as to whether incumbents do better in places where television stations are more likely to cover them. Still, over the last two decades or so, the incumbency advantage has deflated. In a 2008 article, Andrew Gelman and Zaiying Huang analyzed congressional elections through 2000, and found some suggestion that the incumbency advantage was down slightly in the 1990s. So, too, did the Ansolabehere and Snyder article mentioned above. Chapters in the forthcoming book “Governing in a Polarized Age: Elections, Parties, and Political Representation” by Robert Erikson and Gary Jacobson as well as a Midwest Political Science Association conference paper presented by Jacobson all indicate that since 2000, the decline in the incumbency advantage in House races has accelerated. By some metrics, the fall in the incumbency advantage was especially pronounced in 2010 and 2012. Being an incumbent isn’t what it once was. The decline for senators and U.S. representatives has gotten some attention from political scientists, but the evidence also suggests that the incumbency advantage might well be declining for state-level posts like governor. Consider the chart below, which illustrates the observed advantage for incumbent governors seeking re-election when compared to challengers. For 1998, the National Election Day Exit Polls indicate that after accounting for basic individual- and state-level demographics, incumbent candidates for governor were likely to win approximately 8 percentage points more of the vote than challengers were. In 2002, that figure dropped to 4 percentage points, and by 2010, our estimate is just 2 percentage points. Estimating the incumbency advantage precisely is tricky, and explaining why the incumbency advantage has been falling is trickier still. But more polarized parties mean that voters frequently face stark ideological choices at the ballot box, and given that elections are more nationalized, backing an incumbent from the other party with a reputation for bringing home the bacon becomes harder to countenance. Just ask Al D’amato, a New York Republican nicknamed “Senator Pothole,” whose reputation didn’t help him keep his seat from Democrat Charles Schumer in 1998. In the same vein, Nebraska Democrat Ben Nelson probably thought that trying to negotiate a special deal for Nebraska in the Affordable Care Act in 2009 would be received well back home. Instead, the backlash might well have shaped his 2011 decision not to seek re-election. To be clear, voting based on party and voting based on incumbency aren’t always opposites. In a study of Minnesota’s introduction of partisan primaries and ballots in 1973, Ansolabehere and his co-authors found that the incumbency advantage rose at the same time that party voting increased. But overall, as the choices before voters have polarized, it makes sense that voters’ willingness to cross party lines in support of a senator who fills the potholes has waned. For senators like Alaska Democrat Mark Begich or Arkansas Democrat Mark Pryor, it still makes sense to tout one’s constituent service and locally oriented accomplishments. But come next Tuesday, it’s a good bet neither will enjoy the sort of strong incumbent advantage their fathers enjoyed during their time in office. CORRECTION (Oct. 29, 9:51 a.m.): An earlier version of this article misidentified Senate Minority Leader Mitch McConnell as the majority leader. 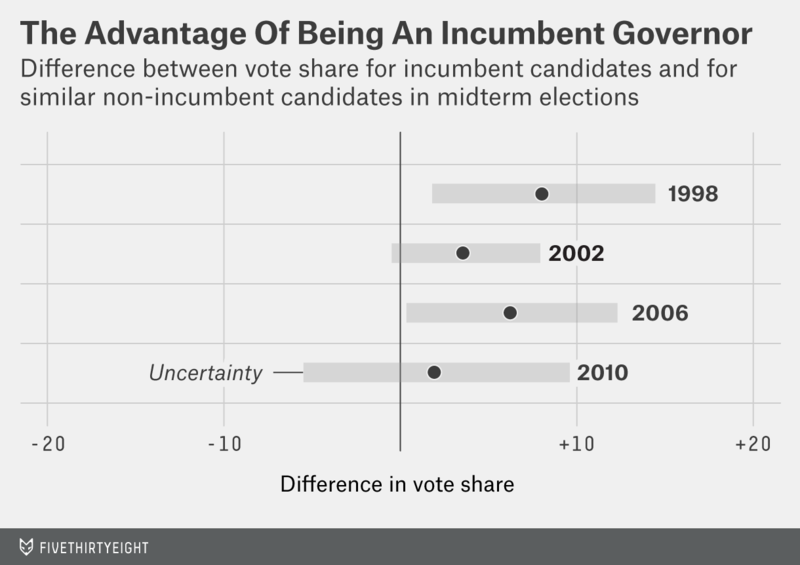 It is also worth noting that the incumbency advantage appears to be a personal advantage, not a partisan one. That is, when the incumbent retires, his or her party gets no advantage from having held the seat, as a forthcoming article by Anthony Fowler and Andrew Hall shows for state legislative elections. So Tom Harkin’s 30 years in the U.S. Senate aren’t likely to help Bruce Braley at the polls even though both are Iowa Democrats.